I hear a huge crash. It’s my favorite glass vase. I hear “I didn’t mean to hurt it, Mommy! It just fell!” as I run full-pelt from the other end of the house. What does my daughter learn from this exchange? How does my own emotional regulation affect what she learns about how to regulate her own emotions? We’ll learn about this in today’s episode. Note that this episode is the second in the ill-fated experimental short episodes – we’ll be back to the regular length hereafter! In case you missed it, the first episode in this series was Three Reasons Not To Say You’re OK.
Bariola, E., Hughes, E.K., & Gullone, E. (2012). Relationships between parent and child emotion regulation strategy use: A brief report. Journal of Child and Family Studies 21(3), 443-448. Butler, E.A., Egloff, B., ,Wilhelm, F.H., Smith, N.C., Erickson, E.A., & Gross, J.J. (2003). The social consequences of expressive suppression. Emotion 3(1), 48-67. Christenfeld, B., Gerin, W., Linden, W., Sanders, M., Mathur, J., Deich, J.D., & Pickering, T.G. (1997). Social support effects on cardiovascular reactivity: Is a stranger as effective as a friend? Psychosomatic Medicine 59, 388-398. Cohen, S., & Wills, T.A. (1985). Stress, social support, and the buffering hypothesis. Psychological Bulletin 98(2), 310-357. Gershoff, E.T., & Grogan-Kaylor, A. (2016). Spanking and child outcomes: Old controversies and new meta-analyses. Journal of Family Psychology 30(4), 453-469. Gottman, J.M., & Levenson, R.W. (1992). Marital processes predictive of later dissolation: Behavior, physiology, and health. Journal of Personality and Social Psychology 63(2), 221-233. Gross, J.J., & John, O.P. (2003). Individual differences in two emotion regulation processes: Implications for affect, relationships, and well-being. Journal of Personality and Social Psychology 85(2), 348-362. Gunzenhauser, C., Faasche, A., Friedlmeier, W.& von Suchodoletz, A. (2014). Face it or hide it: Parental socialization of reappraisal and response suppression. Frontiers in Psychology 4, 992. Kiel, E.J. & Kalomiris, A.E. (2015). Current themes in understanding children’s emotion regulation as developing from within the parent-child relationship. Current Opinions in Psychology 1(3), 11-16. Kopystynska, O, Paschall, K.W., Barnett, M.A., & Curran, M.A. (2017). Patterns of interparental conflict, parenting, and children’s emotional insecurity: A person-centered approach. Journal of Family Psychology 31(7), 922-932. Krantz, D.S., & Manuck, S.B. (1984). Acute psychophysiologic reactivity and risk of cardiovascular disease: A review and methdologic critique. Psychological Bulletin 93(3), 435-464. Laurenceau, J.P., Barrett, L.F., & Pietromonaco, P.R. (1998). Intimacy as an interpersonal process: The importance of self-disclosure, partner disclosure, and perceived partner responsiveness in interpersonal exchanges. Journal of Personality and Social Psychology 75(5), 1238-1251. Meeren H.K.M., van Heijnsbergen, C.C.R.J., & de Gelder, B. (2005). Rapid perceptual integration of facial expression and emotional body language. PNAS 102(45), 16518-16523. Pennebaker, J.W. (1989). Confession, inhibition, and disease. Advances in Experimental Social Psychology 22, 211-244. Tiedens, L.Z. (2001). Anger and advancement versus sadness and subjugation: The effect of negative emotion expressions on social status conferral. Journal of Personality and Social Psychology 80(1), 86-94. Tromssdorff, G., & Heikamp, T. (2013). Socialization of emotions and emotion regulation in cultural context. In S. Barnow & N. Balkir (Eds. ), Cultural variations in psychopathology: From research to practice (pp.67-92). Cambridge, MA: Hoegrefe Publishing. Rime, B., Mesquita, B., Boca, S., & Philippott, P. (1991). Beyond the emotional event: Six studies on the social sharing of emotion. Cognition and Emotion 5(5-6), 435-465. Roomer, L., Williston, S.K., & Rollins, L.G. (2015). Mindfulness and emotion regulation. Current Opinion in Psychology 3, 52-57. Wang, M-T., & Kenny, S. (2015). Longitudinal links between fathers’ and mothers’ harsh verbal discipline and adolescents’ conduct problems and depressive symptoms. Child Development 85(3), 908-923. Hello, and welcome to the Your Parenting Mojo podcast. I’m going to start this episode by telling you a short story. Recently we talked about the first of the three ways that children learn about emotional regulation: through our direct teaching (like saying “You’re OK!” when we can clearly see they’re not). If you think about it, telling a child “You’re OK” is an attempt to get them to suppress their emotions, while saying things like “I’m not mad” through clenched teeth are an attempt to suppress yours. Why might we not want to do that? 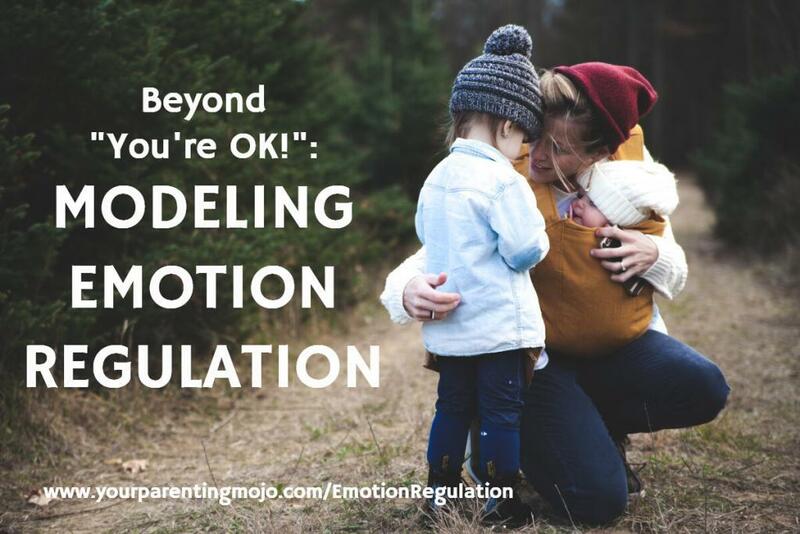 When I started researching the answer to this question, I realized that it constitutes the second of three ways that children learn about emotional regulation: though parental modeling. As I mentioned in our last episode in this series, the third way children learn about emotional regulation is through the emotional climate of the family, and you can see our previous episodes on how parenting impacts child development as well as the impacts of conflicts and divorce. So what can scientific research tell us about parental modeling of emotions? Well, we need to extrapolate a bit here, because most it has been done on couples and college students. We do know that social sharing of emotions through narrative and story is an important social skill, especially following an emotional episode, and self-disclosure is a critical component of intimate adult relationships, and while adult relationships are not the same as parent-child relationships, they do share many similar features. In a marriage, the practice of stonewalling – suppressing verbal, emotional, and backchannel behaviors like head nodding and eye contact – is linked to reduced marital satisfaction. Adults typically use one of two strategies to cope with stressful situations: they reappraise the situation to view it in a less-stressful way – by taking an optimistic attitude, reinterpreting what they find stressful, and trying to get out of a bad mood rather than wallowing, or they suppress negative behavior once the emotions have already occurred, which can have a host of negative effects on the individual. Emotional suppression causes a person to experience themselves as inauthentic, and also to share fewer negative and positive emotions as well as avoiding close relationships. There is some (limited) evidence that emotion suppression may increase physiological stress not only in the suppressing individual (or parent), but also in their partner (or child). Suppressing emotions is linked to increased depressive symptoms and potentially other emotional disorders, reduced immune system functioning and the development of coronary heart disease, as well as indirectly reducing access to social support. Now I’m not saying that you should tell your child every thought that comes into your head, or even that you should give her a full “buck up and stop crying because you’re not really hurt and you’re making me late for my appointment which is going to make me angry” speech every time she falls over. There’s plenty of research supporting the finding that showing significant anger toward children is associated with poor child development outcomes. Excessive demonstrations of anger are rarely welcomed in social settings, although people who express moderate anger over a justifiable situation leads other people to think they are more competent (in adults, at least). It seems that the key here is to understand the optimal amount of emotion to express, given the child’s age, temperament, and the cultural values that you aim to instill in him – as well as how much the child might have hurt himself when he fell. You can then reappraise your response to the situation, which should hopefully cause you to be less angry in the first place, and then express your true emotions which are now – hopefully again – going to be more measured than they would have been if you hadn’t reappraised your response. Sounds like a tall order when you’re in the thick of things and your child just broke something that was important to you, but when you realize that the brain can process information about other people’s emotions in a tiny fraction of a second, you start to see that a very short pause – perhaps the amount of time you need for a single breath – might be enough time to mentally reframe your approach. Janet Lansbury is a practitioner of the Resources for Infant Educarers approach to parenting that we mostly use, and she has a very popular blog and also a podcast called Janet Lansbury Unruffled in which she describes problems that parents are having with their children and write to her about, and then tells listeners how to deal with them – often using scripted stories sort of like I did in this episode to help parents see how they might have a different kind of conversation with their child than the one they’ve been having. A reframing of the parent’s emotional response is implicit in her ‘unruffled’ approach – but unless you’ve read all this research on how the brain processes information, it is very difficult to make it explicit when you listen to Janet’s calm voice telling you how to respond to your child. She isn’t asking you to cover up your emotions, but if you already got angry and she’s telling you to just nod your head and calmly acknowledge your child’s feelings, it’s difficult to understand what you’re actually supposed to do with your anger. The key is that when you see a situation and you know “I’m about to get angry,” to pause, take a breath, and try to get into that reappraising state of mind. Then you don’t have to suppress your anger, because you didn’t get angry in the first place. Let’s talk about how to model emotional regulation. The first thing to realize is that our children learn this reappraising strategy by watching us do it ourselves. This is why a parent’s emotional suppression is directly linked to less use of reappraisal strategies by children (some say a mother’s influence is more important; others say it’s the father’s – perhaps we can agree both are important? ): because they’ve watched their parent suppress emotions, and they need to see reappraisal modeled to know how to use it. The old adage to ‘be the person you want your child to become’ is literally true. It’s hard to believe that something as simple as responding authentically to your child, and allowing your child to respond authentically to you can have such a profound impact, but it really does. What should parents do in the heat of the moment? Learn some common signs of tension that might indicate you’re about to get angry – whether it’s because your child was being careless and fell over (which is going to make you late if they don’t hurry up), or for other reasons. These may include tightness in your throat or chest, shallow or rapid breathing, clenching your jaw, and/or having negative thoughts about yourself or your child. It was a family heirloom passed down by my grandmother. I’ve asked her not to touch it a hundred times. I pause and take a deep breath, and use that time to set an intention: the two things that are more important right now than the vase (which cannot be brought back) is (1) helping my daughter to learn something from the experience and (2) using it to positively (rather than negatively) impact our relationship. Me: Oh, Carys. The vase is broken. That makes me so sad (which is true: my anger turned to sadness during the one-breath pause) – it was a gift from my grandma. What happened? Carys: I was just touching it because it was so pretty, and it fell! Me (gently): Didn’t you remember that we’ve talked about not touching it? Me: Oh, dear. Do you want to come and sit on my lap? (I comfort her for a few minutes, during which she cries, and I might say “I’m here for you,” but I don’t attempt to get her to stop crying.) After her crying decreases in intensity, I could say: Can you tell me why you’re crying? Carys: I’m sad because the vase broke and I thought you would yell at me. Me: Suzie, I’m sorry you thought I would yell at you. I know sometimes I do, and I really do try not to. It scares you when I yell at you, right? Me: Well I’m trying to do better. I am really disappointed that the vase got broken because I loved my grandma and I don’t have many things to remember her by. How are you feeling right now? Carys: I’m a bit sad. Carys: Will you show me your grandma’s picture in your photo album from when you were a little girl? Me: I would love to do that. Shall we get the one from when you visited her when you were a tiny baby, and you burped while she was holding you, and it made her laugh? Reappraising your own emotions before you get stressed by something your child is doing or saying is a powerful technique but it can be very difficult to do in the moment. The pause before responding is critical to giving you the time to do this. To get in the habit, consider instituting a pause before you respond to your child in other ways, as well – for example, before you say ‘no’ to your child. This can allow you a moment to decide whether you really need to say ‘no’ or whether you could say ‘yes’ instead. We all know that spanking neither increases children’s compliance with parents nor supports their emotional development. Then we were told that yelling is just as bad as spanking. Now we know that if we get angry and cover it up, our child might not learn how to regulate their own emotions. If you find yourself getting angry a lot, try to get help for yourself. Don’t forget to put your own oxygen mask on before helping others. Cultivate a practice of mindfulness – of being in and experiencing the present moment, which can help you to institute that all-important pause, as well as develop your own healthy emotional regulation skills. Listening to your example of a healthy expression of emotions with your daughter (after the breaking the base) brought me to tears. I was not parented in a gentle way and I have committed myself to breaking the cycle of emotional abuse with my 17 month old. I’ve been using mindfulness meditation and therapy since pregnancy to work process my childhood and develop the skills I need to ensure a healthy relationship with my girl. I’ve read a lot so far, including transcripts of exchanges like the one you present. But hearing it out loud was very powerful. I felt sorrow for myself as a child for not being spoken to this way. And I felt excitement and joy and hope for my daughter as I have vowed to teach and model emotional regulation. Thank you for this experience. I love your podcast. It is exactly what I need. I went on and reviewed you on iTunes after I dried my tears and finished hugging my daughter. Ashlee, thank you so much for sharing your story. I wasn’t parented like this either. I’m working on an episode on intergenerational parenting issues and will reach out to see if you have any questions I can try to answer.